A quarter of all extranodal lymphomas occur in the head and neck, and 8% of findings on supraclavicular fine-needle aspirate biopsy yield a diagnosis of lymphoma. Lymphoma is the second most common primary malignancy occurring in the head and neck. See the image below. CT scan of a patient with a natural killer (NK)/T-cell lymphoma of the right nasal cavity and maxillary sinus. See Presentation for more detail. See also 10 Patients with Neck Masses: Identifying Malignant versus Benign, a Critical Images slideshow, to help identify several types of masses. Bone marrow aspiration and biopsy (essential). A lymphoma specialist should perform staging and treatment. The Ann Arbor staging system is used to stage lymphomas. Surgery for treatment of lymphomas of the head and neck is only performed in select cases. Otolaryngologists are frequently involved in the diagnosis of lymphoma. A quarter of all extranodal lymphomas occur in the head and neck, and 8% of findings on supraclavicular fine-needle aspirate biopsy yield a diagnosis of lymphoma. In white populations, lymphoma is a more common cause of cervical lymphadenopathy than metastatic disease. Lymphoma is the second most common primary malignancy occurring in the head and neck and importantly, the incidence of aggressive non-Hodgkin lymphoma has risen steadily over recent decades. The image below depicts a lymphoma of the head and neck. Although a variety of histologic classification schemes have been used for lymphoma in the past, the World Health Organization (WHO) classification is currently used. HL is characterized by the presence of Reed-Sternberg (RS) cells, and the subtype diagnosis depends on the cytoarchitectural milieu in which the RS cells or their variants are found. Nodular sclerosis, mixed cellularity, lymphocyte-rich and lymphocyte-depleted subtypes are collectively termed classic HL. Nodular sclerosis is the most common subtype, especially in patients younger than 40 years, followed by mixed cellularity. Lymphocyte-predominant HL, more common in young men than in others, behaves more like a low-grade B-cell lymphoma than other tumors. In general, patients who are elderly, those who live in developing countries, and those infected with HIV are most likely to have widespread disease with systemic symptoms at diagnosis. Approximately 85% of NHLs are B-cell lymphomas. The most common indolent NHL is follicular lymphoma, which is derived from germinal center B cells. Other indolent histologies are lymphoplasmacytoid lymphoma, which has characteristics of B cells differentiating toward plasma cells, and marginal-zone lymphoma derived from the memory B-cell compartment, which includes MALT lymphomas. DLBCL is the most common aggressive NHL. On the basis of messenger RNA microarrays, most cases have profiles that indicate an origin from a germinal center B cell or a postgerminal-center activated B cell. Mantle-cell lymphoma and Burkitt lymphoma are aggressive NHLs that have the characteristics of normal B cells residing in the mantle zone or in the germinal center of a lymphoid follicle, respectively. Cutaneous T-cell lymphomas, such as mycosis fungoides, can be indolent. However, many T-cell NHLs are aggressive malignancies. For HL, overall 5-year survival rates in the United States are 83% for whites and 77% for African Americans. For NHL, the 5-year survival rate is 53% for whites and 42% for African Americans. Lymphoma is the fifth most common cancer in the United States, with an annual incidence of 74,490 estimated cases. Approximately 88% of these cancers are NHLs. The incidence of NHL has doubled over the last 20 years because of the increase in AIDS-related lymphoma (ARL)  ; an increase in the detection of lymphoma; an increase in the elderly population; and for other, poorly understood reasons. The different histologic subtypes of NHL have various distributions and geographic predilections. The frequency of NK/T-cell lymphoma is increased in China, in Taiwan, in Southeast Asia and in parts of Africa where Burkitt lymphoma is endemic. HL and, to a lesser extent, NHL are more common in whites than in African Americans or Hispanics. Other races such as Asian/Pacific islanders or American Indians have the lowest incidence and mortality rates. The incidence of both HL and NHL is higher in men than in women, especially among older patients. In the United States, HL has a bimodal age distribution, with a peak incidence in people aged 20-34 years and a second peak in whites aged 75-79 years and in African Americans aged 55-64 years. In Japan, the early peak is absent, and in some developing countries, the early peak shifts into childhood. The mortality rate increases with age. For example, incidence and mortality rates for NHL increase with age. In addition, Burkitt lymphoma represents 40-50% of all pediatric lymphomas but is uncommon in adults without AIDS. Lymphoblastic lymphoma most commonly affects men aged 20-40 years who have lymphadenopathy and/or a mediastinal mass. Han AY, Kuan EC, Alonso JE, Badran KW, St John MA. Epidemiology of Nasopharyngeal Lymphoma in the United States: A Population-Based Analysis of 1119 Cases. Otolaryngol Head Neck Surg. 2017 May. 156 (5):870-6. [Medline]. Sissolak G, Sissolak D, Jacobs P. Human immunodeficiency and Hodgkin lymphoma. Transfus Apher Sci. 2010 Feb 3. [Medline]. Savage KJ, Johnson NA, Ben-Neriah S, Connors JM, Sehn LH, Farinha P, et al. MYC gene rearrangements are associated with a poor prognosis in diffuse large B-cell lymphoma patients treated with R-CHOP chemotherapy. Blood. 2009 Oct 22. 114(17):3533-7. [Medline]. Younes A, Gopal AK, Smith SE, Ansell SM, Rosenblatt JD, Savage KJ, et al. Results of a Pivotal Phase II Study of Brentuximab Vedotin for Patients With Relapsed or Refractory Hodgkin's Lymphoma. J Clin Oncol. 2012 Jun 20. 30(18):2183-9. [Medline]. Feugier P, Van Hoof A, Sebban C, Solal-Celigny P, Bouabdallah R, Fermé C. Long-term results of the R-CHOP study in the treatment of elderly patients with diffuse large B-cell lymphoma: a study by the Groupe d'Etude des Lymphomes de l'Adulte. J Clin Oncol. 2005 Jun 20. 23(18):4117-26. [Medline]. [Full Text]. Witzig TE, Flinn IW, Gordon LI, Emmanouilides C, Czuczman MS, Saleh MN. Treatment with ibritumomab tiuxetan radioimmunotherapy in patients with rituximab-refractory follicular non-Hodgkin's lymphoma. J Clin Oncol. 2002 Aug 1. 20(15):3262-9. [Medline]. Dunleavy K, Little RF, Pittaluga S, Grant N, Wayne AS, Carrasquillo JA, et al. The role of tumor histogenesis, FDG-PET, and short course EPOCH with dose-dense rituximab (SC-EPOCH-RR) in HIV-associated diffuse large B-cell lymphoma. Blood. 2010 Feb 3. [Medline]. Dunleavy K, Bollard CM. Sobering realities of surviving Hodgkin lymphoma. Blood. 2011 Feb 10. 117(6):1772-3. [Medline]. Castellino SM, Geiger AM, Mertens AC, Leisenring WM, Tooze JA, Goodman P, et al. Morbidity and mortality in long-term survivors of Hodgkin lymphoma: a report from the Childhood Cancer Survivor Study. Blood. 2011 Feb 10. 117(6):1806-16. [Medline]. [Full Text]. Seland M, Holte H, Bjoro T, et al. Chronic fatigue is prevalent and associated with hormonal dysfunction in long-term non-Hodgkin lymphoma survivors treated with radiotherapy to the head and neck region. Leuk Lymphoma. 2015 May 18. 1-9. [Medline]. Teckie S, Qi S, Lovie S, et al. Long-term outcomes and patterns of relapse of early-stage extranodal marginal zone lymphoma treated with radiation therapy with curative intent. Int J Radiat Oncol Biol Phys. 2015 May 1. 92 (1):130-7. [Medline]. Advani R, Rosenberg SA, Horning SJ. Stage I and II follicular non-Hodgkin's lymphoma: long-term follow-up of no initial therapy. J Clin Oncol. 2004 Apr 15. 22(8):1454-9. [Medline]. Ahn YC, Lee KC, Kim DY, Huh SJ, Yeo IH, Lim DH. Fractionated stereotactic radiation therapy for extracranial head and neck tumors. Int J Radiat Oncol Biol Phys. 2000 Sep 1. 48(2):501-5. [Medline]. Alizadeh AA, Eisen MB, Davis RE, Ma C, Lossos IS, Rosenwald A. Distinct types of diffuse large B-cell lymphoma identified by gene expression profiling. Nature. 2000 Feb 3. 403(6769):503-11. [Medline]. Andre M, Henry-Amar M, Blaise D, Colombat P, Fleury J, Milpied N. Treatment-related deaths and second cancer risk after autologous stem-cell transplantation for Hodgkin's disease. Blood. 1998 Sep 15. 92(6):1933-40. [Medline]. Aparicio J, Segura A, Garcera S, Oltra A, Santaballa A, Yuste A. ESHAP is an active regimen for relapsing Hodgkin's disease. Ann Oncol. 1999 May. 10(5):593-5. [Medline]. Batchelor T, Carson K, O'Neill A, Grossman SA, Alavi J, New P. Treatment of primary CNS lymphoma with methotrexate and deferred radiotherapy: a report of NABTT 96-07. J Clin Oncol. 2003 Mar 15. 21(6):1044-9. [Medline]. Bea S, Zettl A, Wright G, Salaverria I, Jehn P, Moreno V. Diffuse large B-cell lymphoma subgroups have distinct genetic profiles that influence tumor biology and improve gene-expression-based survival prediction. Blood. 2005 Nov 1. 106(9):3183-90. [Medline]. Beaty MM, Funk GF, Karnell LH, Graham SM, McCulloch TM, Hoffman HT. Risk factors for malignancy in adult tonsils. Head Neck. 1998 Aug. 20(5):399-403. [Medline]. Bessell EM, MacLennan KA, Toghill PJ, Ellis IO, Fletcher J, Dowling FD. Suprahyoid Hodgkin's disease stage IA. Radiother Oncol. 1991 Nov. 22(3):190-4. [Medline]. Boivin JF, Hutchison GB, Zauber AG, Bernstein L, Davis FG, Michel RP. Incidence of second cancers in patients treated for Hodgkin's disease. J Natl Cancer Inst. 1995 May 17. 87(10):732-41. [Medline]. Bonadonna G, Bonfante V, Viviani S, Di Russo A, Villani F, Valagussa P. ABVD plus subtotal nodal versus involved-field radiotherapy in early-stage Hodgkin's disease: long-term results. J Clin Oncol. 2004 Jul 15. 22(14):2835-41. [Medline]. Canellos GP, Anderson JR, Propert KJ, Nissen N, Cooper MR, Henderson ES. Chemotherapy of advanced Hodgkin's disease with MOPP, ABVD, or MOPP alternating with ABVD. N Engl J Med. 1992 Nov 19. 327(21):1478-84. [Medline]. Carde P, Hagenbeek A, Hayat M, et al. Clinical staging versus laparotomy and combined modality with MOPP versus ABVD in early-stage Hodgkin's disease: the H6 twin randomized trials from the European Organization for Research and Treatment of Cancer Lymphoma Cooperative Group. J Clin Oncol. 1993 Nov. 11(11):2258-72. [Medline]. Cerroni L, Zochling N, Putz B, Kerl H. Infection by Borrelia burgdorferi and cutaneous B-cell lymphoma. J Cutan Pathol. 1997 Sep. 24(8):457-61. [Medline]. Chanan-Khan A, Czuczman MS. Bcl-2 antisense therapy in B-cell malignant proliferative disorders. Curr Treat Options Oncol. 2004 Aug. 5(4):261-7. [Medline]. Cheung MM, Chan JK, Lau WH, Foo W, Chan PT, Ng CS. Primary non-Hodgkin's lymphoma of the nose and nasopharynx: clinical features, tumor immunophenotype, and treatment outcome in 113 patients. J Clin Oncol. 1998 Jan. 16(1):70-7. [Medline]. Cleary KR, Osborne BM, Butler JJ. Lymph node infarction foreshadowing malignant lymphoma. Am J Surg Pathol. 1982 Jul. 6(5):435-42. [Medline]. Coiffier B, Lepage E, Briere J, Herbrecht R, Tilly H, Bouabdallah R. CHOP chemotherapy plus rituximab compared with CHOP alone in elderly patients with diffuse large-B-cell lymphoma. N Engl J Med. 2002 Jan 24. 346(4):235-42. [Medline]. Colombat P, Salles G, Brousse N, Eftekhari P, Soubeyran P, Delwail V. Rituximab (anti-CD20 monoclonal antibody) as single first-line therapy for patients with follicular lymphoma with a low tumor burden: clinical and molecular evaluation. Blood. 2001 Jan 1. 97(1):101-6. [Medline]. Coltrera MD. Primary T-cell lymphoma of the thyroid. Head Neck. 1999 Mar. 21(2):160-3. [Medline]. Cosset JM, Henry-Amar M, Meerwaldt JH, Carde P, Noordijk EM, Thomas J. The EORTC trials for limited stage Hodgkin's disease. The EORTC Lymphoma Cooperative Group. Eur J Cancer. 1992. 28A(11):1847-50. [Medline]. Darrington DL, Vose JM, Anderson JR, Bierman PJ, Bishop MR, Chan WC. Incidence and characterization of secondary myelodysplastic syndrome and acute myelogenous leukemia following high-dose chemoradiotherapy and autologous stem-cell transplantation for lymphoid malignancies. J Clin Oncol. 1994 Dec. 12(12):2527-34. [Medline]. Davis TA, White CA, Grillo-López AJ, Velásquez WS, Link B, Maloney DG. Single-agent monoclonal antibody efficacy in bulky non-Hodgkin's lymphoma: results of a phase II trial of rituximab. J Clin Oncol. 1999 Jun. 17(6):1851-7. [Medline]. Dean RM, Bishop MR. Allogeneic hematopoietic stem cell transplantation for lymphoma. Clin Lymphoma. 2004 Mar. 4(4):238-49. [Medline]. Diehl V, Franklin J, Pfreundschuh M, Lathan B, Paulus U, Hasenclever D. Standard and increased-dose BEACOPP chemotherapy compared with COPP-ABVD for advanced Hodgkin's disease. N Engl J Med. 2003 Jun 12. 348(24):2386-95. [Medline]. Diehl V, Stein H, Hummel M, Zollinger R, Connors JM. Hodgkin's lymphoma: biology and treatment strategies for primary, refractory, and relapsed disease. Hematology Am Soc Hematol Educ Program. 2003. 225-47. [Medline]. Diehl V, Thomas RK, Re D. Part II: Hodgkin's lymphoma--diagnosis and treatment. Lancet Oncol. 2004 Jan. 5(1):19-26. [Medline]. DiGiuseppe JA, Corio RL, Westra WH. Lymphoid infiltrates of the salivary glands: pathology, biology and clinical significance. Curr Opin Oncol. 1996 May. 8(3):232-7. [Medline]. Dunleavy K, Butrynski J, Steinberg S, et al. Phase II study of EPOCH infusional chemotherapy in relapsed or refractory Hodgkin's lymphoma (HL): a report on toxicity, efficacy and prognostic indicators of outcome. J Clin Oncol. 22:6598. [Full Text]. Dunleavy K, Pittaluga S, Czuczman MS, Dave SS, Wright G, Grant N, et al. Differential efficacy of bortezomib plus chemotherapy within molecular subtypes of diffuse large B-cell lymphoma. Blood. 2009 Jun 11. 113(24):6069-76. [Medline]. [Full Text]. Ekstrand BC, Lucas JB, Horwitz SM, Fan Z, Breslin S, Hoppe RT. Rituximab in lymphocyte-predominant Hodgkin disease: results of a phase 2 trial. Blood. 2003 Jun 1. 101(11):4285-9. [Medline]. Ellison E, LaPuerta P, Martin SE. Supraclavicular masses: results of a series of 309 cases biopsied by fine needle aspiration. Head Neck. 1999 May. 21(3):239-46. [Medline]. Engels EA, Chatterjee N, Cerhan JR, Davis S, Cozen W, Severson RK. Hepatitis C virus infection and non-Hodgkin lymphoma: results of the NCI-SEER multi-center case-control study. Int J Cancer. 2004 Aug 10. 111(1):76-80. [Medline]. Ferreri AJ, Guidoboni M, Ponzoni M, De Conciliis C, Dell'Oro S, Fleischhauer K. Evidence for an association between Chlamydia psittaci and ocular adnexal lymphomas. J Natl Cancer Inst. 2004 Apr 21. 96(8):586-94. [Medline]. Freedman AS, Nadler LM. Malignancies of lymphoid cells (Chapter 113). Harrison's Online. 1999. Part 6, Section 2. Friedberg JW, Freedman AS. High-dose therapy and stem cell transplantation in follicular lymphoma. Ann Hematol. 1999 May. 78(5):203-11. [Medline]. Gilliam AC, Wood GS. Cutaneous lymphoid hyperplasias. Semin Cutan Med Surg. 2000 Jun. 19(2):133-41. [Medline]. Gisselbrecht C. Autologous stem cell transplantation in aggressive non-Hodgkin's lymphoma. Hematol Cell Ther. 1996 Aug. 38(4):297-304. [Medline]. Grufferman S, Cole P, Smith PG, Lukes RJ. Hodgkin's disease in siblings. N Engl J Med. 1977 Feb 3. 296(5):248-50. [Medline]. Gutierrez M, Chabner BA, Pearson D, Steinberg SM, Jaffe ES, Cheson BD. Role of a doxorubicin-containing regimen in relapsed and resistant lymphomas: an 8-year follow-up study of EPOCH. J Clin Oncol. 2000 Nov 1. 18(21):3633-42. [Medline]. Habermann TM, Weller EA, Morrison VA, Gascoyne RD, Cassileth PA, Cohn JB. Rituximab-CHOP versus CHOP alone or with maintenance rituximab in older patients with diffuse large B-cell lymphoma. J Clin Oncol. 2006 Jul 1. 24(19):3121-7. [Medline]. Harris NL, Jaffe ES, Diebold J, Flandrin G, Muller-Hermelink HK, Vardiman J. World Health Organization classification of neoplastic diseases of the hematopoietic and lymphoid tissues: report of the Clinical Advisory Committee meeting-Airlie House, Virginia, November 1997. J Clin Oncol. 1999 Dec. 17(12):3835-49. [Medline]. Harris NL, Jaffe ES, Stein H, Banks PM, Chan JK, Cleary ML. A revised European-American classification of lymphoid neoplasms: a proposal from the International Lymphoma Study Group. Blood. 1994 Sep 1. 84(5):1361-92. [Medline]. Hegde U, Filie A, Little RF, Janik JE, Grant N, Steinberg SM. High incidence of occult leptomeningeal disease detected by flow cytometry in newly diagnosed aggressive B-cell lymphomas at risk for central nervous system involvement: the role of flow cytometry versus cytology. Blood. 2005 Jan 15. 105(2):496-502. [Medline]. Hiddemann W, Forstpointner R, Kneba M, et al. The Addition of Rituximab to Combination Chemotherapy with CHOP Has a Long Lasting Impact on Subsequent Treatment in Remission in Follicular Lymhoma but Not in Mantle Cell Lymphoma: Results of Two Prospective Randomized Studies of the German Low Grade Ly. Blood. 2004. 104:161. [Full Text]. Horning SJ, Hoppe RT, Breslin S, Bartlett NL, Brown BW, Rosenberg SA. Stanford V and radiotherapy for locally extensive and advanced Hodgkin's disease: mature results of a prospective clinical trial. J Clin Oncol. 2002 Feb 1. 20(3):630-7. [Medline]. Horning SJ, Weller E, Kim K, Earle JD, O'Connell MJ, Habermann TM. Chemotherapy with or without radiotherapy in limited-stage diffuse aggressive non-Hodgkin's lymphoma: Eastern Cooperative Oncology Group study 1484. J Clin Oncol. 2004 Aug 1. 22(15):3032-8. [Medline]. Horning SJ, Williams J, Bartlett NL, Bennett JM, Hoppe RT, Neuberg D. Assessment of the stanford V regimen and consolidative radiotherapy for bulky and advanced Hodgkin's disease: Eastern Cooperative Oncology Group pilot study E1492. J Clin Oncol. 2000 Mar. 18(5):972-80. [Medline]. Jaffe ES, Harris NL, Diebold J, Muller-Hermelink HK. World Health Organization classification of neoplastic diseases of the hematopoietic and lymphoid tissues. A progress report. Am J Clin Pathol. 1999 Jan. 111(1 Suppl 1):S8-12. [Medline]. Karmiris TD, Grigoriou E, Tsantekidou M, Spanou E, Mihalakeas H, Baltadakis J. Treatment of early clinically staged Hodgkin's disease with a combination of ABVD chemotherapy plus limited field radiotherapy. Leuk Lymphoma. 2003 Sep. 44(9):1523-8. [Medline]. Kieserman SP, Finn DG. Non-Hodgkin's lymphoma of the external auditory canal in an HIV-positive patient. J Laryngol Otol. 1995 Aug. 109(8):751-4. [Medline]. Kwak LW. Translational development of active immunotherapy for hematologic malignancies. Semin Oncol. 2003 Jun. 30(3 Suppl 8):17-22. [Medline]. Landgren O, Björkholm M, Konradsen HB, Söderqvist M, Nilsson B, Gustavsson A. A prospective study on antibody response to repeated vaccinations with pneumococcal capsular polysaccharide in splenectomized individuals with special reference to Hodgkin's lymphoma. J Intern Med. 2004 Jun. 255(6):664-73. [Medline]. Lauer SA. Ocular adnexal lymphoid tumors. Curr Opin Ophthalmol. 2000 Oct. 11(5):361-6. [Medline]. Lenz G, Dreyling M, Hiddemann W. Mantle cell lymphoma: established therapeutic options and future directions. Ann Hematol. 2004 Feb. 83(2):71-7. [Medline]. Lenz G, Hiddemann W, Dreyling M. The role of fludarabine in the treatment of follicular and mantle cell lymphoma. Cancer. 2004 Sep 1. 101(5):883-93. [Medline]. Little R, Wittes RE, Longo DL, Wilson WH. Vinblastine for recurrent Hodgkin's disease following autologous bone marrow transplant. J Clin Oncol. 1998 Feb. 16(2):584-8. [Medline]. Little RF, Pittaluga S, Grant N. Highly effective treatment of acquired immunodeficiency syndrome-related lymphoma with dose-adjusted EPOCH: impact of antiretroviral therapy suspension and tumor biology. Blood. 2003 Jun 15. 101(12):4653-9. [Medline]. Loeffler M, Brosteanu O, Hasenclever D, Sextro M, Assouline D, Bartolucci AA. Meta-analysis of chemotherapy versus combined modality treatment trials in Hodgkin's disease. International Database on Hodgkin's Disease Overview Study Group. J Clin Oncol. 1998 Mar. 16(3):818-29. [Medline]. Lohri A, Barnett M, Fairey RN, O'Reilly SE, Phillips GL, Reece D. Outcome of treatment of first relapse of Hodgkin's disease after primary chemotherapy: identification of risk factors from the British Columbia experience 1970 to 1988. Blood. 1991 May 15. 77(10):2292-8. [Medline]. Mack TM, Cozen W, Shibata DK, Weiss LM, Nathwani BN, Hernandez AM. Concordance for Hodgkin's disease in identical twins suggesting genetic susceptibility to the young-adult form of the disease. N Engl J Med. 1995 Feb 16. 332(7):413-8. [Medline]. Marcinow AM, Hall N, Byrum E, Teknos TN, Old MO, Agrawal A. Use of a Novel Receptor-Targeted (CD206) Radiotracer, 99mTc-Tilmanocept, and SPECT/CT for Sentinel Lymph Node Detection in Oral Cavity Squamous Cell Carcinoma: Initial Institutional Report in an Ongoing Phase 3 Study. JAMA Otolaryngol Head Neck Surg. 2013 Sep 1. 139(9):895-902. [Medline]. McCarthy H, Ottensmeier CH, Hamblin TJ, Stevenson FK. Anti-idiotype vaccines. Br J Haematol. 2003 Dec. 123(5):770-81. [Medline]. Mendenhall NP. The role of radiation in the management of Hodgkin's disease: an update. Cancer Invest. 1999. 17(1):47-55. [Medline]. Miller TP, Dahlberg S, Cassady JR, Adelstein DJ, Spier CM, Grogan TM. Chemotherapy alone compared with chemotherapy plus radiotherapy for localized intermediate- and high-grade non-Hodgkin's lymphoma. N Engl J Med. 1998 Jul 2. 339(1):21-6. [Medline]. Nathu RM, Mendenhall NP, Almasri NM, Lynch JW. Non-Hodgkin's lymphoma of the head and neck: a 30-year experience at the University of Florida. Head Neck. 1999 May. 21(3):247-54. [Medline]. Nelson R. Lymphoseek improves lymph node mapping in head and neck cancer. Medscape Medical News. September 25, 2013. Available at http://www.medscape.com/viewarticle/811622. Accessed: October 1, 2013. Ng AK, Li S, Neuberg D, Silver B, Stevenson MA, Fisher DC. Comparison of MOPP versus ABVD as salvage therapy in patients who relapse after radiation therapy alone for Hodgkin's disease. Ann Oncol. 2004 Feb. 15(2):270-5. [Medline]. [Full Text]. Pfreundschuh M, Trumper L, Kloess M. Two-weekly or 3-weekly CHOP chemotherapy with or without etoposide for the treatment of young patients with good-prognosis (normal LDH) aggressive lymphomas: results of the NHL-B1 trial of the DSHNHL. Blood. 2004 Aug 1. 104(3):626-33. [Medline]. Pfreundschuh M, Trümper L, Kloess M, Schmits R, Feller AC, Rudolph C. Two-weekly or 3-weekly CHOP chemotherapy with or without etoposide for the treatment of young patients with good-prognosis (normal LDH) aggressive lymphomas: results of the NHL-B1 trial of the DSHNHL. Blood. 2004 Aug 1. 104(3):626-33. [Medline]. Pfreundschuh M, Trümper L, Kloess M, Schmits R, Feller AC, Rübe C. Two-weekly or 3-weekly CHOP chemotherapy with or without etoposide for the treatment of elderly patients with aggressive lymphomas: results of the NHL-B2 trial of the DSHNHL. Blood. 2004 Aug 1. 104(3):634-41. [Medline]. Pfreundschuh M, Trümper L, Osterborg A, Pettengell R, Trneny M, Imrie K. CHOP-like chemotherapy plus rituximab versus CHOP-like chemotherapy alone in young patients with good-prognosis diffuse large-B-cell lymphoma: a randomised controlled trial by the MabThera International Trial (MInT) Group. Lancet Oncol. 2006 May. 7(5):379-91. [Medline]. Poiesz BJ, Papsidero LD, Ehrlich G, Sherman M, Dube S, Poiesz M. Prevalence of HTLV-I-associated T-cell lymphoma. Am J Hematol. 2001 Jan. 66(1):32-8. [Medline]. Pratt BL, Greene FL. Role of laparoscopy in the staging of malignant disease. Surg Clin North Am. 2000 Aug. 80(4):1111-26. [Medline]. Prosnitz LR, Farber LR, Kapp DS, Scott J, Bertino JR, Fischer JJ. Combined modality therapy for advanced Hodgkin's disease: 15-year follow-up data. J Clin Oncol. 1988 Apr. 6(4):603-12. [Medline]. Reece DE. Evidence-based management of Hodgkin's disease: the role of autologous stem cell transplantation. Cancer Control. 2000 May-Jun. 7(3):266-75. [Medline]. Rehm PK. Gallium-67 scintigraphy in the management: Hodgkin's disease and non-Hodgkin's lymphoma. Cancer Biother Radiopharm. 1999 Aug. 14(4):251-62. [Medline]. Ries LA, Eisner MP, Kosary CL, et al, eds. SEER cancer statistics review 1973-1998. Available at: http://seer.cancer.gov/. Bethesda, MD: National Cancer Institute. 2001. [Full Text]. Romaguera JE, Fayad L, Rodriguez MA, Broglio KR, Hagemeister FB, Pro B. High rate of durable remissions after treatment of newly diagnosed aggressive mantle-cell lymphoma with rituximab plus hyper-CVAD alternating with rituximab plus high-dose methotrexate and cytarabine. J Clin Oncol. 2005 Oct 1. 23(28):7013-23. [Medline]. Santini G, Chisesi T, Nati S, Porcellini A, Zoli V, Rizzoli V. Fludarabine, cyclophosphamide and mitoxantrone for untreated follicular lymphoma: a report from the non-Hodgkin's lymphoma co-operative study group. Leuk Lymphoma. 2004 Jun. 45(6):1141-7. [Medline]. Schnell R, Borchmann P, Schulz H, Engert A. Current strategies of antibody-based treatment in Hodgkin's disease. Ann Oncol. 2002. 13 Suppl 1:57-66. [Medline]. Siegel RS, Pandolfino T, Guitart J, Rosen S, Kuzel TM. Primary cutaneous T-cell lymphoma: review and current concepts. J Clin Oncol. 2000 Aug. 18(15):2908-25. [Medline]. Sohn SK, Baek JH, Kim DH, Jung JT, Kwak DS, Park SH. Successful allogeneic stem-cell transplantation with prophylactic stepwise G-CSF primed-DLIs for relapse after autologous transplantation in mantle cell lymphoma: a case report and literature review on the evidence of GVL effects in MCL. Am J Hematol. 2000 Sep. 65(1):75-80. [Medline]. Sparano JA, Lee JY, Kaplan LD, Levine AM, Ramos JC, Ambinder RF, et al. Rituximab plus concurrent infusional EPOCH chemotherapy is highly effective in HIV-associated, B-cell non-Hodgkin's lymphoma. Blood. 2009 Dec 29. [Medline]. Spicer J, Smith P, Maclennan K, Hoskin P, Hancock B, Linch D, et al. Long-term follow-up of patients treated with radiotherapy alone for early-stage histologically aggressive non-Hodgkin's lymphoma. Br J Cancer. 2004 Mar 22. 90(6):1151-5. [Medline]. Staudt MR, Kanan Y, Jeong JH, Papin JF, Hines-Boykin R, Dittmer DP. The tumor microenvironment controls primary effusion lymphoma growth in vivo. Cancer Res. 2004 Jul 15. 64(14):4790-9. [Medline]. [Full Text]. Stewart FM. Indications and relative indications for stem cell transplantation in non-Hodgkin's lymphoma. Leukemia. 1993 Jul. 7(7):1091-4. [Medline]. Straus DJ, Portlock CS, Qin J, Myers J, Zelenetz AD, Moskowitz C, et al. Results of a prospective randomized clinical trial of doxorubicin, bleomycin, vinblastine, and dacarbazine (ABVD) followed by radiation therapy (RT) versus ABVD alone for stages I, II, and IIIA nonbulky Hodgkin disease. Blood. 2004 Dec 1. 104(12):3483-9. [Medline]. Ströhmann B, Haake K. [Nasal cavity and paranasal sinus malignancies in the ENT clinic of Charité since 1959]. Laryngorhinootologie. 1991 Mar. 70(3):138-41. [Medline]. Swerdlow SH, Campo E, Harris NL, Jaffe ES, Pileri SA, Stein H, et al. World Health Organization Classification of Tumors of Haematopoietic and Lymphoid Tissues. Terry JH, Loree TR, Thomas MD, Marti JR. Major salivary gland lymphoepithelial lesions and the acquired immunodeficiency syndrome. Am J Surg. 1991 Oct. 162(4):324-9. [Medline]. Vassilakopoulos TP, Angelopoulou MK, Siakantaris MP, Kontopidou FN, Dimopoulou MN, Boutsis DE, et al. Hodgkin's lymphoma in first relapse following chemotherapy or combined modality therapy: analysis of outcome and prognostic factors after conventional salvage therapy. Eur J Haematol. 2002 May. 68(5):289-98. [Medline]. Viviani S, Santoro A, Negretti E, Bonfante V, Valagussa P, Bonadonna G. Salvage chemotherapy in Hodgkin's disease. Results in patients relapsing more than twelve months after first complete remission. Ann Oncol. 1990. 1(2):123-7. [Medline]. Wilson WH, Dunleavy K, Pittaluga S, Hegde U, Grant N, Steinberg SM. Phase II study of dose-adjusted EPOCH and rituximab in untreated diffuse large B-cell lymphoma with analysis of germinal center and post-germinal center biomarkers. J Clin Oncol. 2008 Jun 1. 26(16):2717-24. [Medline]. [Full Text]. Wilson WH, Grossbard ML, Pittaluga S. Dose-adjusted EPOCH chemotherapy for untreated large B-cell lymphomas: a pharmacodynamic approach with high efficacy. Blood. 2002 Apr 15. 99(8):2685-93. [Medline]. Winter JN, Weller EA, Horning SJ, Krajewska M, Variakojis D, Habermann TM. Prognostic significance of Bcl-6 protein expression in DLBCL treated with CHOP or R-CHOP: a prospective correlative study. Blood. 2006 Jun 1. 107(11):4207-13. [Medline]. Wirth A, Wolf M, Prince HM. Current trends in the management of early stage Hodgkin's disease. Aust N Z J Med. 1999 Aug. 29(4):535-44. [Medline]. Witzig TE, Gordon LI, Cabanillas F, Czuczman MS, Emmanouilides C, Joyce R. Randomized controlled trial of yttrium-90-labeled ibritumomab tiuxetan radioimmunotherapy versus rituximab immunotherapy for patients with relapsed or refractory low-grade, follicular, or transformed B-cell non-Hodgkin's lymphoma. J Clin Oncol. 2002 May 15. 20(10):2453-63. [Medline]. Wotherspoon AC. Gastric lymphoma of mucosa-associated lymphoid tissue and Helicobacter pylori. Annu Rev Med. 1998. 49:289-99. [Medline]. Yu KH, Yu SC, Teo PM, Chan AT, Yeo W, Chow J. Nasal lymphoma: results of local radiotherapy with or without chemotherapy. Head Neck. 1997 Jul. 19(4):251-9. [Medline]. Yuen AR, Rosenberg SA, Hoppe RT, Halpern JD, Horning SJ. Comparison between conventional salvage therapy and high-dose therapy with autografting for recurrent or refractory Hodgkin''s disease. Blood. 1997 Feb 1. 89(3):814-22. [Medline]. [Full Text]. CT scan 6 months after treatment with 4 cycles of DA-EPOCH (ie, infused etoposide, doxorubicin, and vincristine with bolus cyclophosphamide and prednisone). 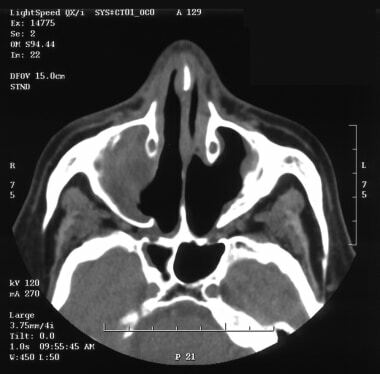 CT scan of a patient with a recurrence of stage I-AE angiocentric lymphoma of the left maxillary sinus, treated 7 years earlier with 4 cycles of ProMACE-MOPP (ie, prednisone, methotrexate, Adriamycin, cyclophosphamide, etoposide–mechlorethamine [nitrogen mustard], vincristine, procarbazine, and prednisone) and 3960 cGy of radiation. CT scan 2 years after salvage therapy. Fiberoptic nasal examination of a patient with natural killer (NK)/T-cell lymphoma of the right nasal cavity and maxillary sinus.